This is the first part in a two-part series examining the planned expansion of palm oil production on the island of Palawan. Read the first part here. Plans to convert eight million hectares of land for palm oil production on Palawan island in the Philippines have been met with opposition from environmental and social advocacy groups, with a petition to cease development sent to the United Nations Commission on Human Rights by an anti-palm oil expansion group. But an industry representative denies claims that all eight million hectares will be cultivated to the detriment of wildlife and human communities, maintaining palm oil expansion will be beneficial to the people of Palawan. The current oil palm expansion project is overseen by Palawan Palm & Vegetable Oil Mills, Inc. (PPVOMI), and Agumil Philippines, Inc. (AGPI). Both companies have only partial Philippine ownership, with PPVOMI 60 percent Singapore-owned and AGPI 25 percent Malaysia-owned, according to the SEI paper. 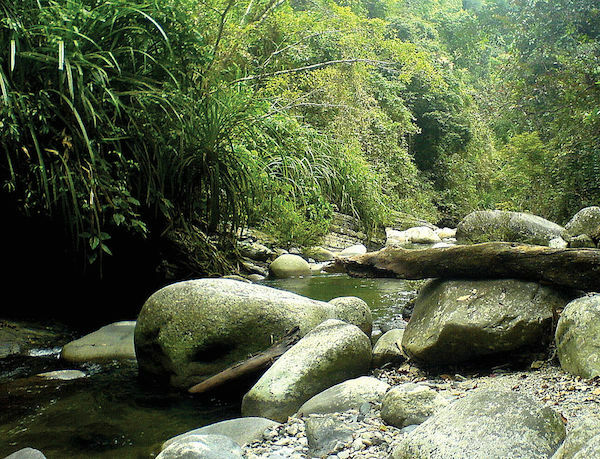 A tributary of the Taranaban River in Palawan, where a new species of spider water beetle was discovered in 2011. Photo by By Hendrik Freitag & Michael Balke. C.K. Chang, who represents PPVOMI and AGPI, said even though it may be possible to grow oil palm on approximately 200,000 hectares (ha) in Palawan, in reality only a fraction of that is developable. “If you have seen the aerial data, most of the parts in that 200,000 ha are protected areas, some parts are hills which require terracing and building of roads which is costly to develop,” Chang told mongabay.com. He added that the Department of Environment and Natural Resources (DENR) permit they received only allows them to develop up to 15,000 hectares. A working paper released by the Sweden-based Stockholm Environment Institute (SEI) earlier this year, showing the extent and implication of the growing palm oil industry in Palawan. According to the paper, six towns have seen the expansion of oil palm plantations. These include Aborlan, Bataraza, Brooke’s Point, Rizal, Quezon, and Sofronio Española. The paper states palm oil concessions occupy up to 99 percent of the total amount of agricultural land in southern Palawan. Government staff in Puerto Princesa City, Palawan’s capital, disclosed that foreign investors coming from Taiwan, Korea, Singapore, China and Japan are looking into acquiring agricultural lands in the province, according to the SEI paper. “Altogether, the Provincial Agriculturist Office receives 15–20 requests per year from agricultural investors hoping for government support. Beyond the existing palm oil project, informal estimates suggest that between 10,000 and 20,000 ha of new land may have already been acquired for oil palm plantations, including for the establishment of new mill(s),” states the paper. Palawan is deemed an ideal location for growing oil palm for a number of reasons: it is relatively accessible, land is affordable, and the population is peaceful—especially compared with conflict-laden Mindanao, where much of the country’s oil palm cultivation occurs. In addition, the town of Brooke’s Point where the Palawan oil palm mill is located has an international port that facilitates easy shipping and trade. The brunt of the current palm oil expansion plans will affect the southern portion of Palawan, which lost more than 600,000 hectares of tree cover from 2001 through 2012 despite most of the island’s designated as a protected area, according to Global Forest Watch. Click to enlarge. Meanwhile, the provincial government recorded at least 14 smallholder palm oil growing cooperatives and two other oil palm cultivation operations in 2013, all of which are bound by contracts to deliver fresh bunches of oil palm fruit to PPVOMI. The SEI paper also showed that many members of the cooperatives are migrant settlers while the laborers on the plantation are indigenous people who complain of unfair labor practices. 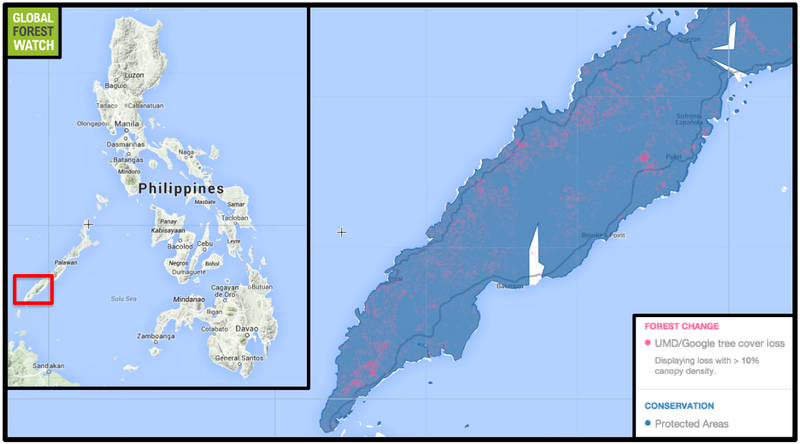 But the biggest problem faced by indigenous people in Palawan is land encroachment as the plantations expand. According to the paper, some members in cooperatives were disqualified from entering the out-grower scheme for failing to provide land titles to the plots they volunteered to be cultivated for oil palm. These complaints have been the basis for a petition for a moratorium by various indigenous people’s rights groups and advocates, including CALG. But a representative of the Palawan provincial government pointed his finger to the National Council on Indigenous People (NCIP), asserting that it was the one responsible in securing the ancestral domains of the tribes. Meanwhile, Chang told mongabay.com that PPVOMI and AGPI do not encroach into tribal lands because they cannot develop without clearance from NCIP, DENR, the Department of Agriculture, the Department of Agricultural Reform (DAR), and local government units. He maintained that the companies’ presence is benefiting the populace of Palawan. “We are actually helping southern Palawan to solve its poverty problem. We are helping farmers… We help develop even the Muslim areas in Bataraza… We do not encroach their lands,” he said. 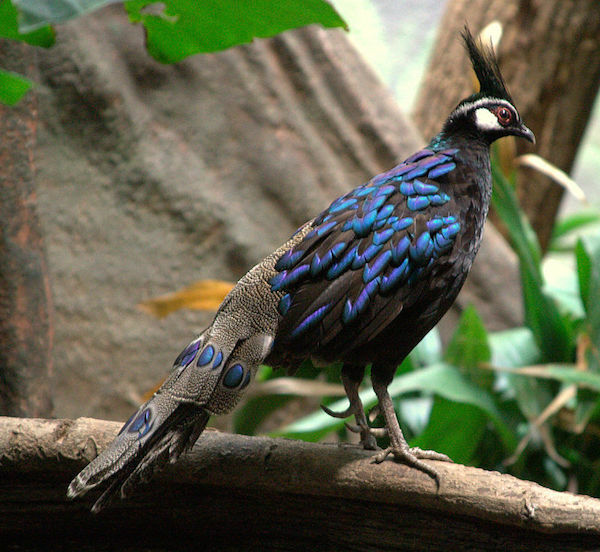 The Palawan peacock pheasant is endemic to Palawan, and is listed by the IUCN as Vulnerable. Photo by Dante Alighieri. CALG said in a statement that even the NCIP—the government agency tasked to protect the rights of the tribesmen—is slow in protecting them from the encroachment of oil palm plantations in their area. Furthermore, the SEI study recommends the land grabbing issue should be taken up by the NCIP, DENR and DAR together to adequately address the concerns of Palawan residents and ensure their wellbeing, as well as that of the environment. limited livelihood opportunities,” states the paper. “Meanwhile, any large-scale land conversion and centralization of productive control carries social and environmental risks. Hansen, M. C., P. V. Potapov, R. Moore, M. Hancher, S. A. Turubanova, A. Tyukavina, D. Thau, S. V. Stehman, S. J. Goetz, T. R. Loveland, A. Kommareddy, A. Egorov, L. Chini, C. O. Justice, and J. R. G. Townshend. 2013. “Hansen/UMD/Google/USGS/NASA Tree Cover Loss and Gain Area.” University of Maryland, Google, USGS, and NASA. Accessed through Global Forest Watch on Dec. 23, 2014. www.globalforestwatch.org. (10/31/2014) About an hour and a half plane ride from the Philippine capital Manila is Palawan, a long, narrow island home to about a quarter of all the animal species found in the country. But the province is losing its forests at a rapid clip due to human population increases, logging, quarrying, mining, and even a huge palm plantation. (10/28/2014) On March 1, 1872, the United States Congress declared 3,400 square miles of land spanning three states as the country’s – and the world’s – first national park. We call it Yellowstone. Today, there are over 160,000 PAs spanning 12.7 percent of the planet’s land surface. (10/09/2014) Want to save forests? Don’t forget the youth, says Pedro Walpole, the Chair and Director of Research for the Environmental Science for Social Change, a Jesuit environmental research organization promoting sustainability and social justice across the Asia Pacific region. ‘Youth leadership in environmental management is key,’ Walpole told mongabay.com. (09/17/2014) Ahead of the upcoming Climate Change Summit to be held in New York, September 23, a Filipino man who last year made headlines around the world on the subject is speaking out. Have scientists discovered a new primate in the Philippines? (08/21/2014) Despite some media reports, scientists have not yet discovered a new species of big-eyed, nocturnal primate—known as tarsiers—in the Philippines. Instead what they have discovered is an intriguing population that is genetically-distinct even from nearby relatives, according to a new open-access paper in PLOS ONE. (08/08/2014) New satellite data from NASA suggests that deforestation is sharply increasing in Bolivia and Mekong countries during the second quarter of 2014. (07/31/2014) Ongoing loss of forest cover in the Philippines places it among the top ten most threatened forest hotspots in the world, with the archipelago ranking fourth, behind Indo-Burma, New Caledonia and Sundaland (a region encompassing Australia and parts of Southeast Asia). 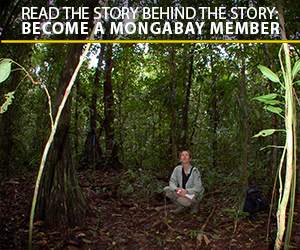 According to a report issued by Conservation International, only seven percent of Philippine forests remain intact. (06/04/2014) The Philippines is proposing to convert 8 million hectares (20 million acres) of ‘idle, denuded and unproductive lands’ for oil palm plantations, reports the Philippine Daily Inquirer. (05/23/2014) The U.S. Midwest and Northeast experienced one of the coldest, snowiest winters on record this past season. This might seem contrary to warming trends forecast by climate scientists, but a new analysis released today in Science points out that climate change caused by greenhouse gas emissions may actually have contributed to the well-below average temperatures seen in parts of the U.S.
(05/15/2014) On Friday, eleven Chinese fishermen were caught by Filipino police with 555 marine turtles, 378 of which were dead. Officials in the Philippines have since released the 177 living turtles. But the incident has sparked an international standoff between the Philippines and China as the Chinese nationals were arrested in disputed waters in the South China Sea. (04/16/2014) A long snout with teeth jutting from the sides? Check. Catfish-like barbels dangling from its chin? Got them. Gills on the side of its body? It has those, too. These are characteristics of a bizarre group of sharks known as sawsharks. And until recently, only seven species were recognized. However, a new discovery raises that number by one more.